So apparently when you are about to marry a [born and raised] Pakistani guy, you start to think that maybe, just maybe, you should also brush up on your Pakistani cooking skills and know how to make the more common Pakistani dishes. As a result, last night’s dinner was chicken biryani. Counting last night, I have now made biryani a grand total of only three times in my life. Once, way back in high school [to the best of my recollection] at least ten years ago, once last year on Ayaz’s birthday upon his request and then one more time last night. If you know me, then you are well aware that while I cook often, and enjoy doing so, I tend to cook non-Pakistani dishes most of the time. Mainly because I’m not a fan of eating it either. I suppose it has somewhat to do with the fact that I would prefer to eat other [lighter to eat, easier on the stomach] cuisines. Oddly enough though, two of my favorite things to eat are Pakistani dishes: haleem and bihari kabab. More than anything else, this post is a write up mainly for me– because we all know I am going to need it for future reference 🙂 . Here’s how I made it yesterday [based on what Ami told me]. I list the amounts for two different versions: a smaller serving and a hefty family size serving. To chicken, add: fried onions, yogurt, lemon juice, paprika, black pepper, garlic, ginger, salt, a pinch of garam masala (if using 1/2 a chicken or add half a teaspoon for 2 chickens), combination of Bombay biryani and Sindhi biryani mix (if you are using two chickens: use a little less than 1 box combined; for half a chicken, add just 1/4 box combined). Spray your pot with non-stick cooking spray. Add the marinated chicken on high heat. When the chicken starts to cook, reduce the heat to very low heat and let the chicken cook completely. You know the chicken is done when you test the leg piece and it’s cooked through. When chicken is about half way done, add cut potatoes to it. For the rice portion: use 6 cups of rice if you are using 2 chickens; if you are using just 1/2 a chicken, take only 2 cups of rice. When boiling rice [on high heat], add 1 long [clove] if are using half a chicken (ot 3-4 if using 2 chickens), eliachi [cardamom] (same amount as long), a pinch of kala zeera), some oil [1 tablespoon for 1/2 chicken, 2-3 tablespoon for 2 chicken] and the same amount of apple cider vinegar (which helps the rice not break). Also add 2-8 black peppercorns [depending on the amount of rice/chicken], salt, and a whole cinnamon stick. As soon as rice starts to boil take it off the heat and drain– you only want to have the water start to boil until the rice is almost done– it will still be a little hard, but won’t break when you press it. Should/could take about 20+ minutes. Next, to your big pot [over very low heat]: add the chicken to the bottom before adding the rice on top [don’t mix yet]. Add a sprinkle of fried onion, some lemon juice [1-4 teaspoon depending on the amount of rice/chicken], some garam masala powder, and some poudina [mint]. If you are adding fresh poudina, also add a few fresh small green peppers and cut up tomatoes. Lastly, sprinkle in some food coloring if you want [orange or yellow]. Leave your pot covered, and on extremely low heat, for about 30-40 minutes. Turn off the heat, keep the pot covered, and leave it alone for another hour before you mix the biryani [and serve]. 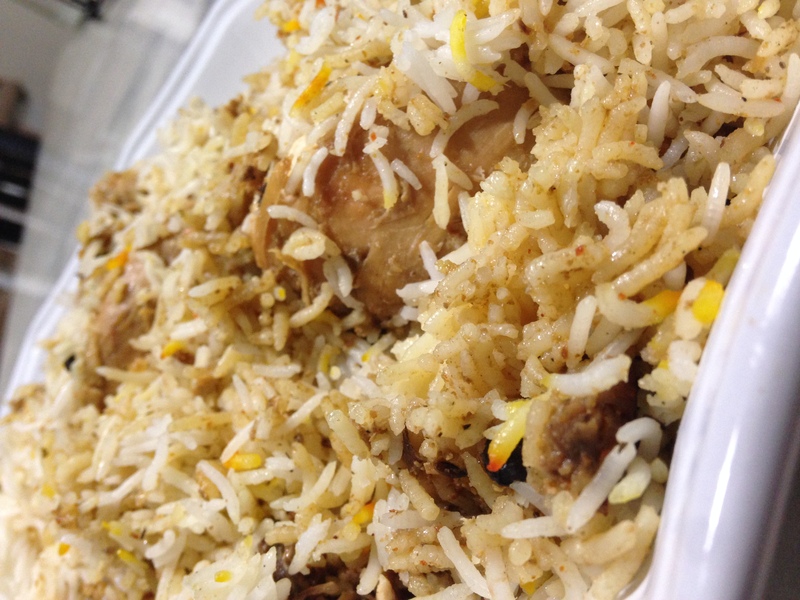 Tip: two types of raita will work great with this biryani. Click here to see the one I have already posted about in the past. The other one is this: to yogurt, add garlic powder, salt, diced up tomatoes, poudina (mint), and diced up cucumbers. If you are using red meat [baby goat works well], the meat will just take longer to cook [and you will need more ginger].